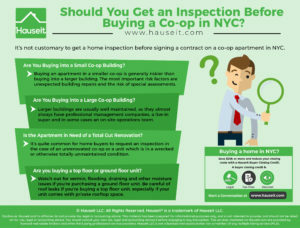 Should You Get an Inspection Before Buying a Co-op in NYC? 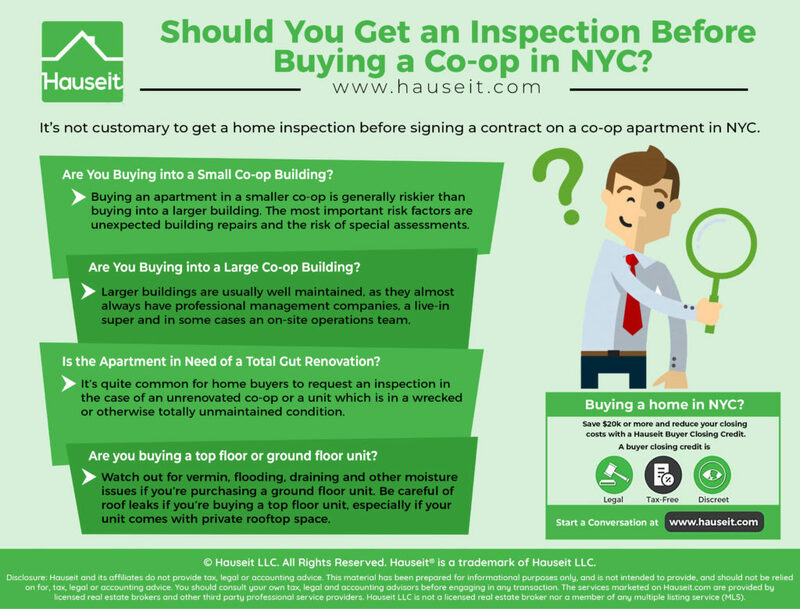 It’s not customary to get a home inspection before signing a contract on a co-op apartment in NYC. With that said, there are a number of instances where hiring a home inspector makes sense in the case of a coop. 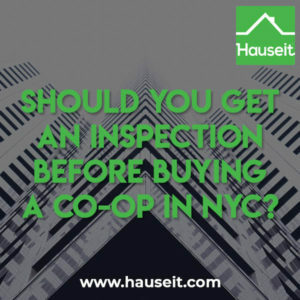 The topic of home inspections for co-ops in NYC is a confusing one, primarily because many New York City listing agents will tell you that they’re totally non-standard even when there are clear instances where paying for a home inspection is a good idea. Are You Buying into a Small Co-op Building? Is the Apartment in Need of a Total Gut Renovation? Does Your Apartment Have a Basement? Are You Buying into a Large Co-op Building? Does Your Apartment Have a Roof Deck? Buying an apartment in a smaller co-op is generally risker than buying into a larger building. There are two main reasons for this. The first and most important risk factor is when it comes to building repairs and the risk of special assessments. When a smaller building needs capital upgrades to expensive components such as the roof, boiler, façade or elevators, there are fewer apartment owners who share the bill. As such, hiring a home inspector to assess the overall condition of the building may be a good idea if you’re buying into a building with 10 or fewer units. The second reason why smaller co-ops are risker is due to the fact that they may not have a good managing agent who has been conducting routine maintenance on the building. In some cases, smaller buildings are self managed. This means that the unit owners themselves take charge of the day to day management of the building, including things such as paying the super, preparing the financial statements and managing building repairs. To be fair, it’s not always the case that self-managed buildings are in worse condition than comparably sized buildings with a third-party managing agent. Many smaller buildings opt for self-management because they simply don’t have the budget for a more established managing agent, and some smaller managing agents are simply terrible. We’ve seen numerous instances whereby a smaller co-op building fired its managing agent, only to see the building improve in condition and reduce each shareholder’s monthly maintenance bill. 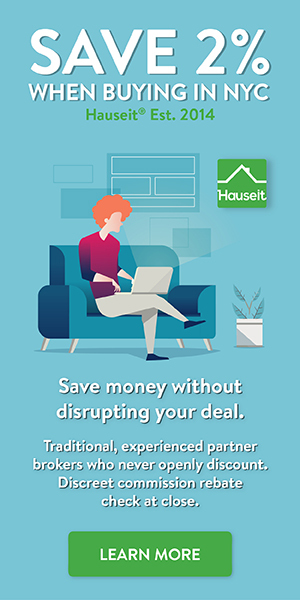 Pro Tip: Calculate how much apartment you can afford to buy in NYC with Hauseit’s interactive home affordability calculator. It’s quite common for home buyers to request an inspection in the case of an unrenovated co-op or a unit which is in a wrecked or otherwise totally unmaintained condition. Co-op apartments being sold in this condition are usually a product of an estate sale or other scenario where someone has continuously occupied an apartment for decades. In the case of an estate sale, the unit may not have received any upkeep for many years. More often than not many of the visually concerning elements in a wrecked unit such as water stain marks on the ceiling or cracks on the walls are not serious. In the case of ceiling water stains, the leak likely emanated from the upstairs apartment and was fixed a long time ago. However, the owner never bothered to repair and repaint the ceiling. With that said, there’s no harm in paying a few hundred dollars to hire a home inspector before putting down 20% or more on a co-op. It’s a good idea to request an inspection if your unit is a garden-level apartment and/or has basement access. Having either of these features likely means that you’re buying into a smaller building, and smaller co-ops are often times risker than larger buildings for the reasons we discussed previously. Common issues with garden-level units include flooding and draining challenges, vermin well as moisture issues. Inspections are not customary for a typical co-op apartment in a large building. Provided that the unit has been adequately maintained, an inspector usually won’t be able to uncover much more than what you can observe with your own eyes. Larger buildings are usually well maintained, as they almost always have professional management companies, a live-in super and in some cases an on-site operations team. Bear in mind that even if you decide to hire an inspector, there’s no guarantee that the building will permit him or her access to any of the critical building systems such as the roof or any systems in the basement such as the boiler room. Special caution should be exercised in the event you’re buying a co-op with a private roof deck or if your apartment is on the top floor. While liability for most leaks originating outside your unit are the co-op’s responsibility, this won’t stop you from having a miserable time if your ceiling starts leaking. If the roof deck above your unit is private vs. communal, it’s also possible that the liability for repairs could be more nebulous compared to if the roof top was completely communal. After all, would other unit owners feel good about paying for leaks which solely affect your apartment and your private roof deck? Even if they reluctantly agree to help you out, they probably won’t go out of their way to move things forward quickly! As such, it’s a good idea to request a home inspection if your unit is on the top floor and/or if your apartment has a private roof deck. Liability for repairs of your private roof terrace will be evaluated as part of your real estate lawyer’s due diligence report which is prepared before you sign a purchase contract. Can I Use an Adjustable Rate Mortgage When Buying a Co-op in NYC?